Failed validation report: Department of Finance home page. For a full-size view, click on the image. 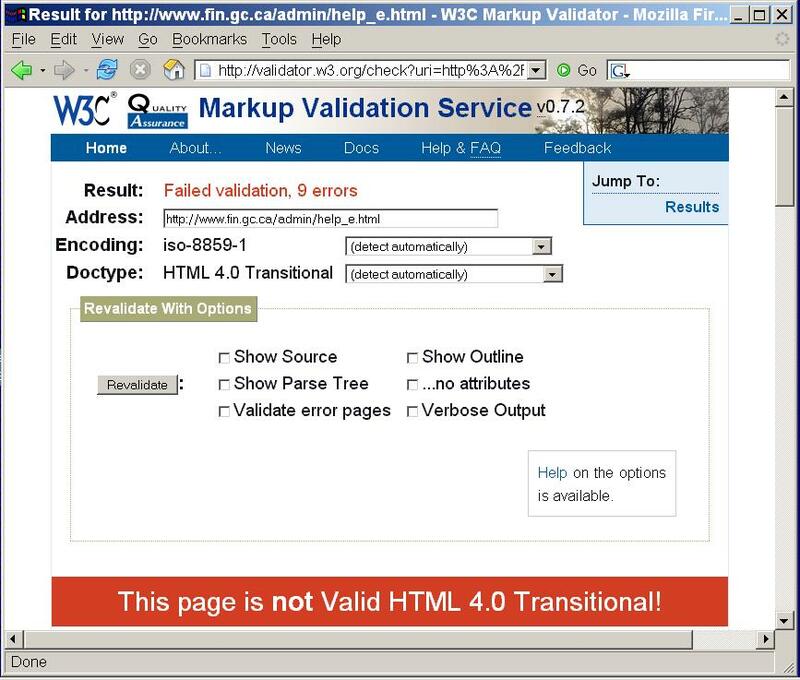 Failed validation report: Department of Finance, Minister's page. For a full-size view, click on the image. Failed validation report: Department of Finance, Parliamentary Secretary's page. For a full-size view, click on the image. Failed validation report: Department of Finance, Deputy Minister's page. For a full-size view, click on the image. Failed validation report: Department of Finance, Accessibility, Design Standards page. For a full-size view, click on the image. Failed validation report: Department of Finance, FAQ page. For a full-size view, click on the image. Here's another problem in this Department of Finance website. In the Accessibility, Design Standards page, this statement appears: "The Finance Canada WWW site has been designed...for use with a computer screen resolution of 800×600 pixels." The 800×600 screen, favoured by the Department of Finance as its standard for the purpose of designing its website, is now used by less than one-third of Internet viewers. By this arbitrary decision, the Department of Finance has cavalierly brushed aside more than two-thirds of Canada's population. Any taxpayer-funded website should work properly when viewed with any monitor screen from a width of 800 pixels to 1280 pixels. And there's yet another problem with the Department of Finance's approach to website design. 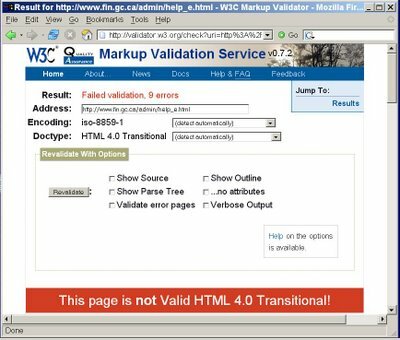 In the Accessibility, Design Standards page, this statement appears: "The Finance Canada WWW site has been designed for use with MS Internet Explorer version 4 or more recent and Netscape version 4.7 or more recent." exist and are used to some extent. The Department of Finance policy to design its website to work with Netscape, while ignoring Firefox, Safari and Opera, is at least five years behind the times. It cannot be defended today. Any taxpayer-funded website should work properly when viewed with any of the most-used browsers — IE (for both PC and Mac), Netscape, Firefox, Safari and Opera, at least. This is easy to accomplish — design your website to meet the W3C standards, and then all browsers that comply with these standards (as all good browsers should) will display your website properly. This is the reasoning behind the Canadian Government's policy requiring that: "All GoC Web sites must comply with W3C Priority 1 and Priority 2 checkpoints to ensure sites can be easily accessed by the widest possible audience." This is the reason I've tested these GoC pages with the W3C Validator. This is the reason these GoC pages should not contain validation errors.